In U.S. history, who was the first African American to vote? Who was the first woman? What year? (Yes, I said “year”, not “years.”) No, that first vote wasn’t in a presidential election. It wasn’t even in a state election. The first recorded time in U.S. history when an African American and a woman voted was in 1805 at a location on the Pacific Northwest Coast. The election was held by the Corps of Discovery to determine the location of the winter fort. York – William Clark’s slave – voted. Sacagawea – a Native America woman and one of the expedition’s guides – was also allowed to vote. York is seated in the third row of the canoe in this artwork. Born in 1770, York was a slave of the Clark Family. He probably grew up with William Clark, who eventually became his master. York went with the Corps of Discovery on their journey west and may have found some level of equality and freedom as all members of the expedition worked hard to survive together. As far as we know, he didn’t write any records, so it’s difficult to know what he thought about the journey and how it affected him. Historical records are contradictory about York’s life after the expedition. Some claim that Clark freed York. Others say York continually asked for freedom, but never received it. And additional records say York ran away. We do know that Clark had respect for York. He named two locations after him: York Islands in the Missouri River (modern day Montana) and York’s Dry Creek (a stream feeding into the Yellowstone River in Montana; now called Custer Creek). York received the honorary rank of sergeant in the U.S. Army in 2001 from President Clinton. Sacagawea is shown on the far right in this artwork. Sacagawea was a Shoshone woman who traveled with the expedition from Fort Mandan to the Pacific and back to Fort Mandan. Her husband – Charbonneau – had been hired as interpreter and guide and she and her son went along too. 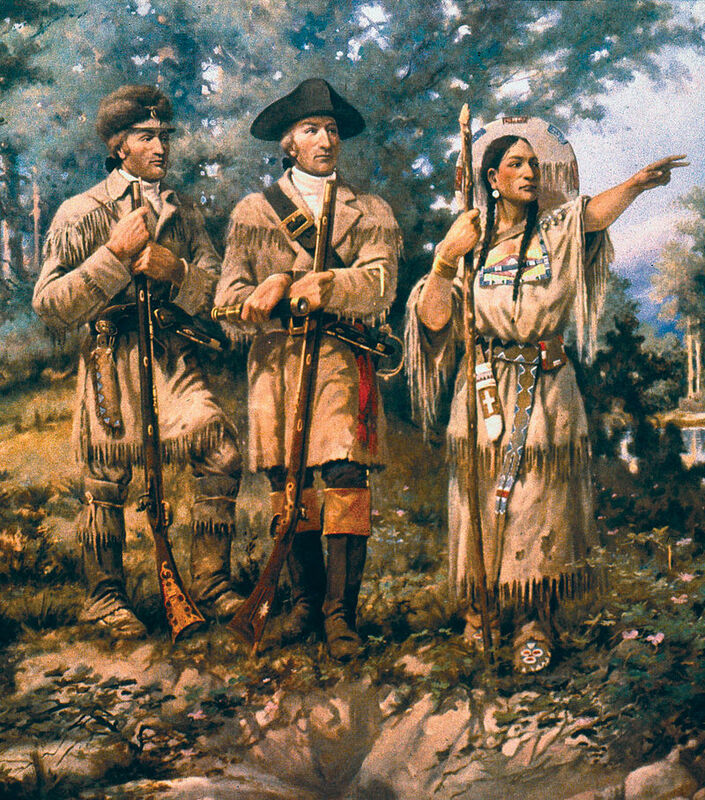 From Lewis and Clark’s journals, it seems that Sacagawea may have been a more helpful guide and interpreter than her husband. On several occasions, she recognized important landmarks. During the corps encounter with the Shoshone tribe, Sacagawea helped get the horses the expedition needed to cross the mountains. There aren’t many clear details about her life before or after the expedition. In her youth, she was captured by a warring tribe and eventually traded, gambled, or sold to Charbonneau. After the expedition, some accounts say Sacagawea died of illness; oral tradition claims she returned to her tribe and lived there for many decades. Sacagawea has been romanticized in art and stories. She has been honored on a commemorative U.S. Dollar coin, and there are several statues and memorials celebrating her life. In 1805, American culture only allowed white males to vote. 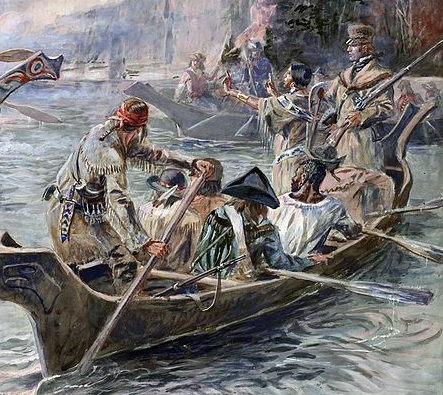 It would’ve been easy for Captains Lewis and Clark to record and accept the votes of the white male members. Instead, as they debated where to built their winter fort on the Pacific Coast, they called for a vote by all expedition members. And they actually recorded everyone’s vote. York and Sacagawea voted. Did Lewis and Clark think they were setting an important precedent? Probably not. They likely realized that everyone worked hard and should be entitled to an opinion and vote. However, they did set a precedent that later generations would point to as African Americans and women petitioned the U.S. government for the right to vote. Let us hope her statues and memorials stand for ever and in 150 years some political correctness Pres and political party do not see fit to remove and destroy them as well .